Is There A 64-Bit Version Of Grapher? Is Grapher Capable Of Running On Windows 64-Bit? Grapher 9 and above are available in 32-bit and 64-bit versions. Grapher utilizes a hybrid installer which means that both the 32-bit version and the 64-bit version of Grapher are packaged together. When you install it on the computer, the installation detects the type of operating system you have. 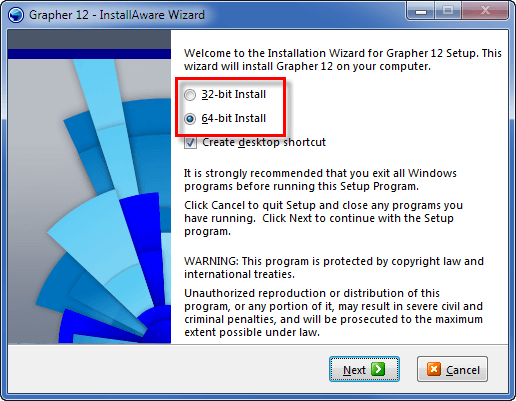 If you have a 32-bit operating system, Grapher will automatically install the 32-bit version. If you have a 64-bit operating system, Grapher will default to the 64-bit version but you do have the option to install the 32-bit version instead if you wish. In the Search programs and files box or the Search the web and Windows box, type System. Click on the System option in the Control Panel. At the top of the System window, the Windows edition is listed. In the middle of the window, the System type is listed. If this shows 64-bit, you can install the 32-bit or 64-bit version of Grapher. If this shows 32-bit, you can only install the 32-bit version of Grapher. During the install, select the desired version in the installation dialog below. Select the appropriate installation type in the first installer dialog. Can I make a stiff diagram in Grapher?